One single plant, but masses of flowers: that’s the Florallure Sublime Orchid for you. The stylish, luxurious look and fresh colours make this the perfect feature in every home. Cheer up your surroundings with Florallure. 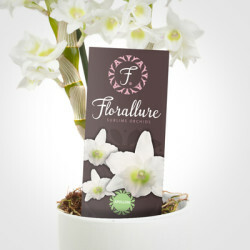 It’s not by chance that Florallure is called the ‘Sublime Orchid’. 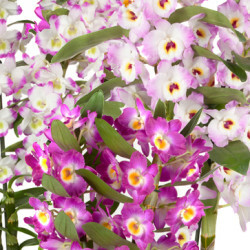 It is a collection with only the finest quality Dendrobium Nobilé. The Florallure comes in a range of different colours, from fresh white to intense pink and its flowers are in two colours. It’s not only the plant itself, but also its presentation that makes Florallure unique. Labels, pot covers and tray bands have all been designed to heighten the brand experience and naturally: to stimulate your sales! We can develop bespoke promotional material upon request. 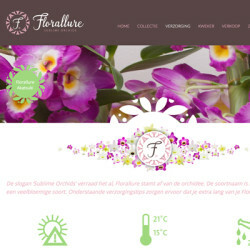 In order to provide our common target audience, the consumer, with all the information required about Florallure we have developed a dedicated website: www.florallure.com. This site, which is entirely in line with the strong brand image, allows the consumer to read about the Dendrobium Nobilé, its care and the range on offer.